Washington, D.C. (TADIAS) – Cuso International, North America’s largest volunteer-based development organization, is seeking skilled diaspora professionals willing to donate their time in Ethiopia as part of the Diasporas for Development Initiative — a public-private partnership supported by USAID and Accenture. The initiative is designed to promote the mobilization of diaspora communities to address human resources gaps, often due to “brain drain,” in their countries of ancestry and heritage. Kayla Sainato, Program Support Officer at Friends of Cuso International in Washington, D.C., shared that the current openings in Ethiopia include recruitment of volunteers for multiple placements in Addis Ababa as well as a position as a Women’s Promotion Livelihood Officer in Assosa. The positions require a university degree in enterprise development, marketing and other relevant business disciplines or work experience in women and youth economic empowerment. 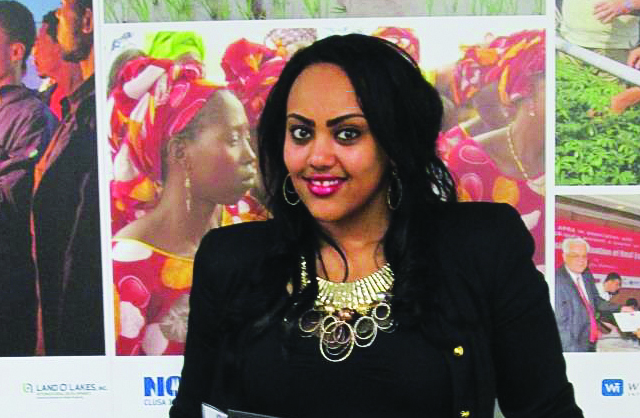 Kayla highlighted the success of past and present volunteers like Melat Ijigu, who was selected to receive the 2013 VEGA Diaspora Volunteer Award for her outstanding service working with the National Network of Positive Women Ethiopians (NNPWE). She was honored at an awards ceremony and reception at VEGA’s Washington, DC offices in May this year in conjunction with the 2013 Global Diaspora Forum. Melat has lived in the U.S for the past 15 years and holds a BA in Communications from Northern Illinois University and Master’s in Social Work from Loyola University Chicago . During the course of her one-year volunteer assignment in Ethiopia, Melat helped NNPWE deliver improved services to its core beneficiary group: HIV-positive women residing in several regions of Ethiopia. After conducting a needs assessment of the organization at the start of her placement, Melat applied successfully for a grant from VSO Ethiopia to set up PMTCT (Preventing Mother-to-Child Transmission of HIV) training for Home-Based Care Providers (HBCPs) from all the 23 associations that make up the NNPWE network. Kayla noted that for those interested Cuso International she will be hosting a virtual information session for US based diaspora professionals to learn more about volunteering overseas on Thursday, October 3rd at 4 pm EST. To register and for more details, please click here. Or you may apply directly via the Cuso International website.